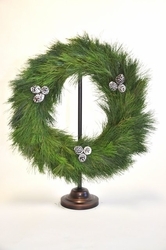 Home > Holidays > Holiday Wreaths > Pine w/ Cones 24"
This beautiful wreath is made with Long Needle Pine and accented with Pine Cones. This item is 24" in size and will usually last 1-2 weeks, or longer depending on the climate. Available in round or square.